Safe Handling of Raw Milk: Keep it Fresh! There are all sorts of things that the farmer can and should do on the farm to keep raw milk safe and healthy for his customer. That’s not what I’m here to talk about. Once you’ve decided to go with a raw milk share or purchase raw milk, you as a consumer need to know how to keep your milk the freshest and safest possible. We are new to raw milk as of January, so we’re still learning. This was really helpful info! Need to learn more about how to use raw milk? Try GNOWFGLINS Fundamentals, a multimedia course with videos, text files, and teacher interaction to help you through the new frontier of traditional foods. This means that your milk cannot get above 38 degrees F, even in your car on your x-minute drive home from the farm in 90-degree summer heat. Can you make that guarantee? Only if you take certain precautions. Our dairy farm is very good about reminding the cow share customers to use their coolers and ice packs, (all the time) especially in the summer months. Best size: two quarts (1/2 gallon) or smaller are best because they cool faster than gallons, are easier to handle and keep cold evenly. Our milk comes in gallon jars, so it would be advisable to transfer to half gallon size or quarts upon coming home. Plastic lids are the best, because metal lids rust and get dings and then shouldn’t be used for food anymore. Rinsing or soaking empty bottles right away helps a lot. Lukewarm water will remove most milk and cream. Do not use hot water first, because it will “set” the milk proteins, gradually forming a film that can cause odor and souring of your milk. If you’re going to use the dishwasher for the jars, rinse and rub them first with cold and/or lukewarm water. If you’re handwashing the jars, still begin with lukewarm water before plunging the jar into hot dishwater. Be sure to use a bottle brush if your hand is too large to fit into your jar. Is the milk being chilled quickly and immediately and traveling to your home without a break in the cold chain? Very hard water can make an impact. Try disinfecting the jars (see below). Air dry in the direct sunlight, minimum of 20 minutes, best between 10-2:00. Place drained jars in a warm but turned-off oven (after baking something would work, just make sure the temp is not over 150 degrees F). Obviously don’t include the plastic lids. Metal lids can be disinfected with boiling water and put in the oven to dry. Make sure bottles are completely dry before capping for storage. “The HPS method is effective for extra cleanliness of your containers if your milk does not keep for at least a week, and to reduce spotting from hard water. Hand-wash and rinse as above. HPS is most reactive at high dilution, so use in wet jars. Set wet bottles with lids and/or caps in a shallow container to catch the solution so it can be reused for several bottles. One to two ounces of HPS will treat 3-4 bottles. Pour about one ounce of 3% HPS over the mouth and inside of a bottle, then cap or cover it with your hand and shake for one minutes to distribute the liquid. Pour HPS into the next container and set the first aside to drain. When you have used HPS on all your bottles, hold them up to the light. Any remaining organic material will show up as foamy white bubbles. Repeat the hand washing until no foam appears on contact with HPS. When all containers have been treated, rinse well to remove any traces of chemical stabilizers from the HPS. Place containers on a clean towel to drain and dry. I really like this idea over using a bleach solution because it’s more environmentally sound and good for my family’s health, plus it’s great that you can see the milk protein with the bubbling action and know if you need a “do-over”. I’m sure HPS can be purchased in bulk if necessary. If HPS doesn’t work well enough, use this method. Containers that are properly washed and prepared will “keep” clean for several weeks once capped. Always use coolers, ice packs, and something to cushion the jars inside the coolers. You could use a blanket or cardboard. If you fill your own, it’s best to fill cold jars. Using ice packs can accomplish this. Check temp of fridge; should be 38 degrees or below. Store milk in the coldest part of the fridge if possible. Use the door shelf only for the bottle in current use. May need to place ice packs next to milk in fridge if having spoiling problems, especially for the milk that will be stored the longest. My tip: Whenever I’m thawing meat or frozen leftovers, I put them on and around my milk jars to help accomplish this super-cold space. Promptly return bottle(s) to fridge after pouring from them. Milk also decreases in quality if it is too cold. You don’t want ice crystals in your milk. Use plastic (to prevent shattering) and leave 1 in. headroom. Freeze as quickly as possible (the coldest part of your freezer) and shake periodically during freezing to keep cream in suspension and the cold distributed evenly. To use, thaw slowly at room temp until there is just a small chunk of ice in the milk. Shake milk often during thawing to keep it cold throughout. Fast thawing will result in curdling and/or separation of cream from milk. Our milk co-op group has found that keeping the COLD CHAIN consistent makes a big difference in the milk’s longevity. Nobody likes sour milk, especially at $6 a gallon! I’m always pleased to be able to keep my milk at its best, so using ice/frozen food in the fridge, smaller containers, and making sure if you travel distances with milk you freeze it first are very important to me. Thanks for joining me! 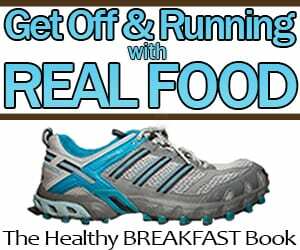 Please visit Real Food Wednesday at Cheeseslave. Our raw milk comes in the plastic gallon jugs like you see at the store (with the plastic ring seal as well). The only difference is there is no label, or sometimes that “Not for Human Consumption; For Pet Use Only” sticker. The farm it comes from sells some of their milk to Organic Valley. I’ve thought about tranferring it to glass jars, but never got around to it. Our milk stays fresh for about 8-10 days though, so I assume it’s ok.
Great post and tips for handling raw milk! Great consumer info.We are farmers hoping to get a milk cow soon with a few friends doing shares. Can you point me to a good source for farmers on how to keep our milk fresh and healthy from the cow to the ‘fridge’? I bet there are resources out there, but as a non-farmer, I’m not sure where to start. I wonder if our milk farm could give you a link to something. You can find them on my local resources page under “What to Buy” in the top menu bar. Email should be on their website. Awesome that you’re getting a cow!!! Ours comes like Jen’s. Good reminder to keep it consistently cold! Our milk is in glass jars and I chose that farm specifically for that reason! Thanks for this post! I’ve read one looses a days freshness for every hour the milk is out of the fridge. Thanks for this detailed post. One can buy food grade Hydrogen Peroxide. One brand is called Oxy-Tech by Eagle Enterprise. It’s a 35% solution, I have a 16 fl oz bottle. To reduce to 3% mix 11 oz. distilled water with 1 oz of Oxy-Tech. It needs to be kept in fridge after opening & it a hazard if it touches skin at that 35% neat solution so would have to keep it well clear of kids & handle carefully. So awesome to make your own dairy products like that! Are you doing mozzarella cheese, too? Yes! I’m making mozzarella, cottage cheese, feta and simple hard cheeses. Time consuming but sooo good!! Most times I don’t have enough cream to make butter, but that is really good too! I’m apart of a milk share, but it’s where you have to milk it yourself. It’s been a lot of fun and I’ve been learning a lot along the way. I really appreciate the information you provided. There were quite a few tid-bits I didn’t know. Thanks! My question is regarding the two conflicting pieces of information from your blogpost that I will cut-n-paste below. They are about the oven method of sanitization. One says 150 degrees the other says 220 degrees. Can you help clarify? “Place drained jars in a warm but turned-off oven (after baking something would work, just make sure the temp is not over 150 degrees F). Obviously don’t include the plastic lids. I’m sure it worked without me having to overthink it ! Thanks for responding Have some good holidays! we use 150 micron pvc bags which are easy to kmnot and pathogen free most of the times. Victor, I was concerned to read that you use PVC bags. While they might be pathogen free, PVC products can leach lead and phthalates into the food and then be ingested. There is a lot of information online if you want to learn more. You said, if your going to travel with it, freeze it first. Thaw slowly! How do you suggest to thaw it slowly? I have a gallon that got shoved way in the back of the refrigerator & it froze. Last time this happened I just let it thaw in the refrigerator but, it took a week! What are your suggestions? Gail – the thawing slowing was basically just to drink a little and hope some is still frozen as you travel, I think. I doubt there’s any problem with letting the milk thaw in the fridge or on the counter. I had to chuckle a bit to myself at your last paragraph; we pay $12.50 a gallon (cowshare)! God bless KY. We pay $4 a gallon from the Amish, but bring our own container. Thank you for this post, Katie, this was really helpful. I live alone and can’t often use up a half-gallon before it gets funky (and while I know there are a zillion things to do with souring milk, and I do them, it still annoys me), and none of the local dairies do quarts, so I’ve been getting a little bit longer shelf life by “decanting” the half-gallon into smaller bottles. Since I don’t have a really big pot, or anywhere to put a big pot, boiling bottles like for canning was a real pain, and I can taste bleach even if the jar was well-rinsed, I was about to buy a sanitizer product from the homebrew supply store! To folks in general – I get hydrogen peroxide in 32-oz bottles from the drugstore for under a dollar, although once in a blue moon it’ll go on sale for 2/$1 (when I buy a case! ), and at the dollar store. I use it instead of chlorine bleach, when white vinegar isn’t appropriate. Ironically, the lowest price I’ve seen for gallon jugs of hydrogen peroxide is $6! Hi, I live in a tropical country that doesn’t “do” raw milk, and the very-local farmer I buy my milk from thinks it is insane to drink it raw. I just bought 4 liters of raw milk from him, and he says sometimes the milk stays out of the fridge for up to 5 hours after milking. I probably can convince him to refrigerate faster in the future, but I really don’t want to cook this batch of milk, so please tell me, can I at least make raw yogurt with this? Thanks! I imagine I’m wayyyyy too late catching up on comments to help you on this batch (sorry!) but if the milk is fresh from the cow, I’m almost positive you’re golden. Problems come if it’s been cooled, then warmed again, then cooled. Since your farmer isn’t set up for raw milk, do make sure he’s getting some testing for the safety of his milk (100% grassfed?). You don’t want to risk your health on milk from unhealthy animals…. I’m wondering if you have any advice on how to transport raw milk about 1 1/2 hours away. Just wondering why we can ferment raw milk (kefir) and it doesn’t make us sick? Thank you very much for this article about how to insure raw milk stays fresh for 7-10 days. We are in the process of figuring out why our milk from the raw milk dairy is unreliable. One time it was good and lasted til the gallon was finished, but most times it sours quickly, and worse, the last time we picked it up, it already tasted “off” (the first signs of souring) when we opened it! Our dairy bottles in plastic jugs, but we now have jars ready and waiting here at the house for rebottling. When we pick up the milk it always goes straight into the cooler packed with ice in the back of the car. Our fridge seems sufficiently cold in one area so we keep the milk there. However, this all doesn’t explain why the milk was already going sour before we even opened it up this last time around. So, we have to assume something is wrong at the dairy. My hope is you can provide some help as to how we can troubleshoot with our farmer. What is the best way to go about asking (pleading!) they change something in how they keep the milk, because it clearly looks like there’s a problem there. Also, could you please give more information as to how hard water can impact milk? How does hard water effect the storage of milk? Thank you so much! I appreciate your help. I know you are more than likely not dealing with this issue anymore but just thought I would comment in case some else is having the same issues. It could be the cold chain on your famers part but there many other facts as to why your milk doesn’t have a good shelf life. Fyi, My husband and I are run a raw milk dairy. It could be the cows have a high cell count(and/or mastitis), or the cows aren’t getting clean enough before milking and a lot of crud is getting into the milk(even if they are filtering it out right away). Or the milk equipment is not clean enough after every milking and/or they aren’t doing a soak and a deep cleaning about every week to get rid of any milk stone(hardened milk proteins). There is a also a cold loving bacteria in milk, so even if milk is staying cold enough it’s still going to sour faster because the bacteria loves cold. Normally that is caused by not clean enough milk equipment or milk stone. Great info! For all of you producers please take a serious look at http://www.rawmilkinstitute.org . The government officials are impressed with the results. I would like to drink warm raw milk instead of cold raw milk from the fridge. However, I do not want to destroy the heat-sensitive nutrients of raw milk by heating. Do you know what is the highest advisable temperature to heat raw milk without destroying its nutrients? I was wondering is there a reason you can’t hand dry the glass jars with a paper towel? Thank you for all your helpful tips! Hi! We just bought our first raw milk from 14 carrot whole food grocery in South carolina. It has a peculiar smell not the smell of going bad milk but i think its of the animal, its udder i don’t know . So if i boil it and then store will the smell go. I googled some said its safe to drink raw milk directly while some say its better to boil and store.We bought it on 21st and the expiry is of 26th but they had it on sale all the gallons for 5.99 instead of 8.99. So we bought two of them. Great tips. The milk we purchase is quick-cooled. But I drive the 30 minutes from the farm to my house with it in a styrofoam cooler. I have even had to stop to feed my kids and left it in that cooler for 2 hours. It didn’t affect the shelf-life at all. Being quick-cooled, the farm tells me it’s good for 3 weeks. But I’ve used it up to 4 weeks after milking. How do you know when it goes bad? Milk stored for 6 months to use as fertilizer still has no sour smell. I use to get raw milk from a small family dairy and it would consistently last 3+ weeks. I am now getting it from a different small dairy and my current jug is almost 2 weeks old and still taste as fresh as the day I brought it home. The current farm has a rapid cooling system like larger dairies. I pay $13.40 a gallon in Oregon. Is this good enough to participate? I have doubts. I bought a half gallon of raw milk, put it in a cooler with ice packs, brought it home, and forgot it was in my car. It was there about 6 hours, so when I remembered it, the glass was not freezing cold, but I’m sure the milk got above the recommended temperature. You’re totally fine, Kathi! 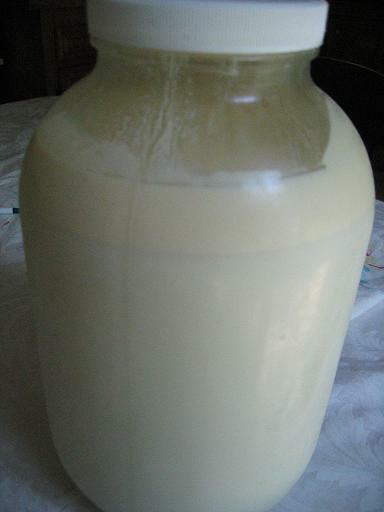 Many people intentionally leave raw milk out to sour or use it for fermentation. It might not taste as fresh, but you can absolutely use it. I’ve been in a raw milk co-op for about 5 years. I have some nagging questions about cream. I always skim off the cream and I used to always make butter. However, I found the butter would have an off taste after just a day or 2, or if I didn’t make it immediately after skimming the cream. I have need up freezing it and using it for cooking but the family wasn’t crazy about eating it on their toast, etc. I also like to keep cream in the fridge for coffee or to make fresh whipped cream, but I’ve also found the cream will be off tasting after only 2-3 days, while the milk will still be good. I buy 2-3 gallons every week, and skim the cream when I open a new jar of milk. Any suggestions for me? Hi Debbie. I’ve heard before that skimmed raw milk will taste fresh longer than unskimmed raw milk, and combined with your experience it makes me think that maybe the cream is more quick to sour than the rest of the milk. I’m not sure if there’s anything you can do about that, but I wonder if it would suit your needs to freeze it in small portions (like ice cube trays) so you could have fresh tasting cream on demand. This is so terribly informative, I would to thank you for that and I would also like to ask some advice on defrosting the raw milk, how should it be done and for how long can one keep milk in the freezer. Where do you all buy your milk bottles? I’m finding very few resources online.